Nesting: Why are her eyes white? 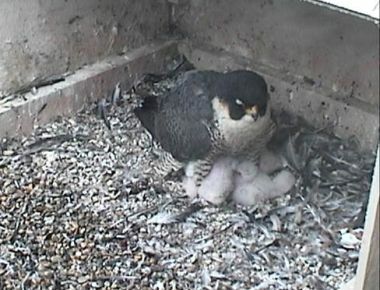 Question: I was watching the web camera and saw the adult peregrine’s eyes go white. What does this mean? Answer: When a peregrine’s eyes look white it’s because his eyes are closed. Peregrines are actually equipped with three eyelids. The upper and lower eyelids are white; the lower one tends to close first. They also have a nictitating membrane – the third eyelid – that protects and moistens their eyes. Because it’s translucent they can still see when it’s closed. This third eyelid is especially important when peregrine falcons dive on prey. In a fast dive they can travel 200 miles per hour so they blink the nictitating membrane rapidly to keep their eyes moist and clean. They can’t afford to get grit in their eyes at that speed. Many birds and mammals have nictitating membranes including owls and cats. Humans don’t have this eyelid any more, just a vestigial bit in the corner of our eyes closest to our noses.